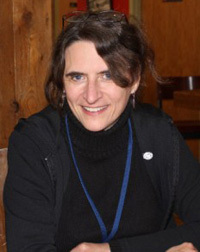 JULIA SPENCER-FLEMING: Sara J. Henry, like me, is a Mason-Dixonite. She grew up in the south but now makes her home in the Green Mountain State. Her debut, Learning to Swim, initially caught my eye because it's set in New York State's Adirondack mountains. 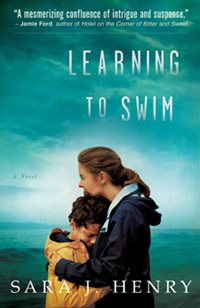 Learning to Swim caught a lot of eyes - it was an Emerging Author pick for retail giant Target, nominated for a Barry Award, and last month, it went on to win the prestigious Mary Higgins Clark award during Edgars Week, and then went on to win the Best First Agatha Award at Malice Domestic. 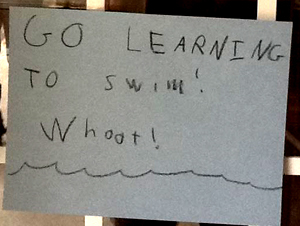 However, Sara's not here to tell us why we should read Learning to Swim (although you really should!) She's here to give us a peek into what it's like to live the mystery writer's dream come true. I live on a dirt road in southern Vermont—excitement is when a fox tunnels into my yard and I try to referee a chase between dog and fox as they lap the yard, me alternately trying to grab my 105-pound Newfie mix and direct the fox to a fox-sized opening in the fence. A long time ago I wrote a novel. Parts were good and parts weren’t, and I put it in a drawer, where it stayed for a very long time. Eventually I pulled it out and revised it, over and over, until it was published. In the 14 months since I did two panels, and went to the few bookstores who asked me. And then my amazing twelve days began. I head off to appear at the wonderful St. Louis County Library’s annual Suspense Night. (This, because at the previous fall’s Bouchercon, I’d shoved a copy of my novel into the library director’s hands, being abominably bad at talking about my work.) It goes well, and I’m delighted by the attendance of three long-ago Tennessee high school friends, now St. Louis transplants—one of whom arrives dressed as my novel’s main character, complete with fake ponytail. Home one night, and then off to Booktopia in Manchester, Vermont. (This, because I’d forced my reticent self to meet the folks at Northshire Bookstore some time back, with my writer pal A.S. King’s words ringing in my ears, Sara, you HAVE to go to bookstores and meet people.) This is one of those events where you feel they accidentally invited the wrong person – there are seven other authors here, amazing authors, ones with books dancing around the New York Times bestseller list. I meet the delightful Richard Mason and Madeline Miller (the other debut author) at the opening party, and the next day appear with the wonderfully generous Howard Frank Mosher. The final event at Northshire is open to the public, and every chair is filled. I am scared almost spitless. I’m second to speak, and decide I’ll start with a funny childhood story. And people laugh, and I freeze only once, infinitesimally, and the result is now a podcast over at Books on the Nightstand. Then to NYC where I appear on a panel with SJ Rozan at the MWA Symposium, and think from the audience’s blank faces that this must be the most boring panel ever, until I learn this is simply what people look like when listening. In a restroom I do a Superman-style fast change, to the shoes and black dress stashed in my daypack, and head into the MWA Agents and Editors party, where I’m up for the Mary Higgins Clark award. I’m happily standing there, with the analytic side of my brain assessing what I should say if I win, and then my name is called. And what I never once considered—the emotional impact of winning—hits me like a tidal wave, an enormous one. I cannot move, I cannot think, I almost cannot breathe. And I cry a little, but only a little, during my talk. Next I’m at my cousin’s house in Virginia, where I play with my four adorable young cousins and do a book club group, and get up horribly early to drive to Malice Domestic in Bethesda. And there I have a lovely time at my first-ever Malice, until the awards ceremony where I am astoundingly up for a best first novel Agatha, and this time I refuse to let myself think that I could win, refuse to think of what I might say if I do, and sit in a sort of frozen stupor. (Yes, I am wearing the same immune-to-rolling-up black dress.) And then my name is called. So I stumble up there and stumble through a speech and stumble back to my table. And there, with my award teapot sitting in front of me, I dissolve into a puddle of tears, and my wonderful friend Jess Lourey takes charge of me for the rest of the evening. On the way home I stop at the home of A.S. and Mr. King and daughters, where I’m greeted with lovely child-drawn signs, and spend the day with people I love. And so end my amazing, incredible, wonderful twelve days. Now I am back on my dirt road in Vermont, marveling at the turns my life has taken—all because I wrote a novel that I decided to take out of the drawer, and didn’t give up on. 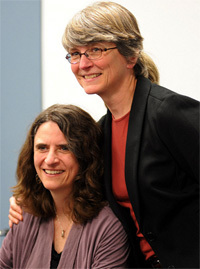 You can find out more about Sara, and read an excerpt of Learning to Swim, at her website. You can also follow her on Twitter as @SaraJHenry and like her on Facebook. So many congratulations, Sara! I just got my copy of Learning to Swim in the mail yesterday and can't wait to read it. What's next for you? Sara, I'm looking forward to the book too. It was such great fun to watch you win both awards--your speeches were heartfelt and lovely. I look forward to meeting you at Crimebake and reading many books! Having witnessed the awarding of your Agatha let me assure you that you did not so much stumble through the speech as you did truly appear to be (all Malice attendees in unison now) gobsmacked at the honor. While you did warn us that you had nothing prepared, your speech was lovely and touching and you held together admirably well. We were all immensely pleased for you. I love your twelve days and I loved watching you approached the podium to accept your award at Malice and gave a tender speech. 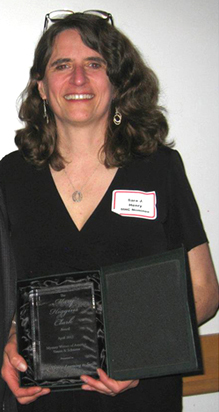 Love your story, Sara, and even if you did beat me out for the Mary Higgins Clark award I loved your novel. I have several dead novels "in a drawer" but every time I dig one out, all it does is remind me why it's in there. Can I borrow your drawer?? You were the picture of grace and gratitude, and I LOVE that you have a Kinsey Millhone-style unwrinklable black dress that you wear to all your award-getting. YAy! I saw you at the Symposium, and at Malice, and I have to say your expression was--memorable. I've never seen someone so happy. It's wonderful. Tell us a little about "Learning"! In addition to many other things I liked about LEARNING TO SWIM, I was impressed straight away with how you solved the problem of her car and house keys. It seems like a small detail, but it's not. The way you worked that out, sensibly, made me think, okay, this is an author who cares about detail and logic. I can trust her. As a reader, that matters to me. It was also helpful that you told a great story, of course. Congratulations on the honors! See now...and I feel as if I discovered you first. I was in Flemington NJ at Twice Told Tales and the bookseller kept raving about your book so I bought it - and I remember telling Hallie about it at MWA University last summer. So delighted for all of your recent (and future) success. Hank, I'm going to steal from Hallie, who gave what I think was one of the best descriptions ever of Learning to Swim in the Boston Globe: "A single woman dives headlong from a ferry into Lake Champlain to rescue a child, and then must figure out what to do with him. Compulsively readable, this is all about what we do for love." I could not say it better. Ramona, many thanks! I am exceedingly detail oriented, and in fact originally overloaded the manuscript with details and explanations - I cut one entire expository chapter near the end. Sara, I couldn't have said it better than Hallie, either. I read your book early on, and I was completely hooked from the very first scene. After that I couldn't put it down. I remember I kept thinking, "I hope somebody notices this book." And "I can't believe this is a first novel." Glad to know people did, and that there is a sequel! Yay! And huge congrats on your success! Congratulations, Sara. You'll never forget the glow of those first awards. 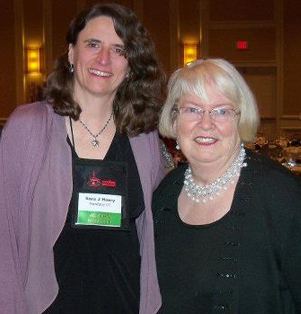 I'm sorry I didn't get to meet you at Malice, but I hope to be at Bouchercon. Tchah! Living on the west coast means that all I ever get to say is "ditto". Sara, you were far from stumbly that night at Malice. LtoS is sitting on my to-be-read pile humming softly to me. Can't wait. What an absolutely wonderful story about your twelve days--and about your book. Can't wait to read it! Rhys - so sorry about your Malice injury! Yes, will see you at Bcon - never miss it! Catriona - thanks much! And it was lovely to meet you at Malice. Barb - thank you, and I hope you love the book! What a wonderful twelve days. Your book has been recommended by several people. I can't wait to read it. I read the book shortly after it was published (Poisoned Pen here in Phoenix gave it a glowing review) and am very excited to learn there is a sequel coming out this year! It is great to see you here on Jungle Red since this is where I first learned about your book. A bookseller (from Washington State, I think) mentioned some of their current favorites and your book sounded fantastic. I have been busy recommending it ever since. Can't wait until November! Congratulations on the awards!! Oh wait, I said that on your blog already. So inspiring! I love it that your novel is a drawer-novel made good! I'm trying to imagine how excited (and terrified?) you were when your name was announced. It really does seem like a dream come true. Looking forward to reading it! Darlene, hope you love it. CindyD, Poisoned Pen was SO great to me - had one of my best events ever there, plus my cousin Joan got to attend! Lisa, it wasn't really excitement or terror - just an amazing sense of unreality. And, well, happiness. So--tell us a bit about the new book! We can't wait! Ah, Hank, you've got me, since I don't have any wonderful reviewer's descriptions to draw from - book descriptions are not my strong point! But it's called A COLD AND LONELY PLACE, coming out in November, and is the second in the series, featuring many of the same characters. It's set in winter, opening in Saranac Lake - involving Troy and her roommates, families and long-buried secrets, all against the backdrop of insulated, insular mountain towns. The first line is We could feel the reverberation of the ice-cutting machine through the frozen lake beneath our feet. And now I'm going off to my friends who are great at book descriptions to help me write one that doesn't give too much away! I was chatting with an editor the other day at some event--he said--"The first line should make you need to read the second line..." And of course, yours does!